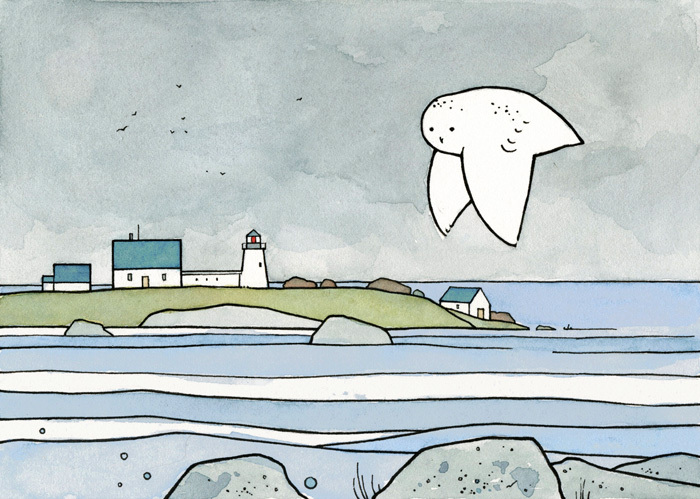 Illustration #11: Snowy Owl flying along a cold coast. So much of my work this past year has been inspired by my trip to Maine. Here is another one, based on Goat Island Lighthouse. The gray wintery day seemed appropriate for the cold snap we are having here in Maryland. Especially pleased with this colors of this one. This is lovely, so tranquil…. Thanks, I think that is one of the things that makes Maine so great. Thanks for looking! I love this simple style. Very attractive!